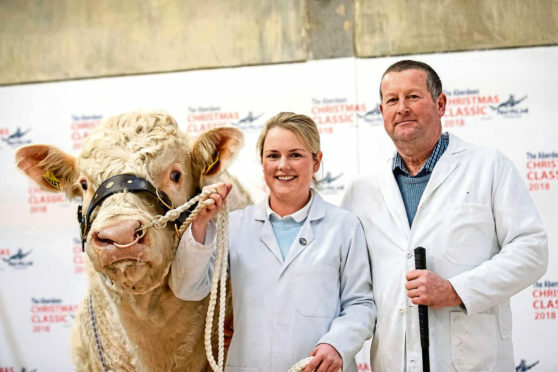 Anna Robertson and her father Iain from Lower Inchcorsie, Rothiemay, Huntly, with the 4,000gn Charolais bull Inchcorsie Nugget. A clearance rate of 37% was achieved when only 10 of the 27 bulls forward met successful bids. The sale topped at 4,000gn twice. First at this price was a Charolais named Inchcorsie Nugget, by Barbican Lancer, from Anna Robertson, Lower Inchcorsie, Rothiemay, Huntly. He sold to W&V Leith, North Crannoch, Crossroads, Keith. The other at 4,000gn was the reserve Aberdeen-Angus champion from Wendy Willox, Broadmyre, Clatt, Huntly. Strathinver Elmo, by Mountjoy Poldark, sold to WJ Milne, Backshalloch, Mulben, Keith. Next best at 3,800gn was the reserve Limousin champion from the Hendry family at Heads of Auchinderran, Aultmore, Keith. Aultmore Ninja, by Powerful Irish, sold to Ballintomb Farm, Dulnain Bridge, Grantown. Thereafter, a Simmental bull from the Wrights at Lagavaich, Glenlivet, Ballindalloch. Lagavaich Ironman, by Williams Eddie, sold to Innes & Aldridge, Carlton House, Archiestown, Aberlour. The Limousin champion was Ritchies Neverman, by Rahoney Isaac, from Aileen Ritchie, Tamala, Whitecairns. He sold to the Whytes at Nether Kirkton, Barthol Chapel, Inverurie. The overall and Charolais champion – Tonley Neymar, by Caylers Hustler, from the Watties at Mains of Tonley, Alford – sold for 2,800gn to the Barclays at Ardiecow, Fordyce, Banff. Also at 2,800gn was Limousin bull Elrick Notable, by Foxhillfarm Impeccabull, from Mike Massie, Mains of Elrick, Auchngatt. He sold to D Hessin, Balnamoon, Keith. A Salers bull – Rednock Lennox, by Rigel Byron – from the Pyes at Port of Menteith, Stirling, sold for 2,200gn to AW Frank & Son, Rennieshill, Newmachar. The Aberdeen-Angus champion – Culfoichmore Mercury, by Weeton Karate Lad – from the McConachies at Culfoich House, Grantown. He sold to WJ Milne, Backshalloch.